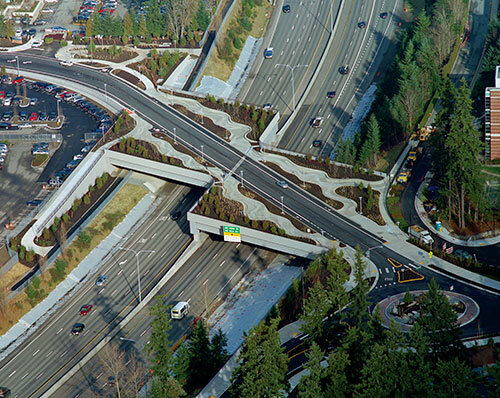 Spanning 480 feet across Interstate 520 in Redmond, Wash., the NE 36th Street Bridge is not your average overpass. The bridge actually comprises two separate spans, joined in the center, that boast not only carefully considered landscape design, but also expansive installations — both vertical and horizontal — of award-winning decorative concrete. The NE 36th Street Bridge earned Belarde Co. Inc. a 2012 Decorative Concrete Award from the American Society for Concrete Contractors’ Decorative Concrete Council in the category of Artistry, Over 5,000 Square Feet, and it’s not difficult to see why. Entering or exiting the bridge, drivers navigate around a custom-colored, stamped concrete roundabout that directs the flow of traffic. Alongside the roadways, pebble-studded concrete paths wend through lush landscaping, hemmed in by the project’s high point: a curving, sloping wall, replete with meticulously seeded aggregate striations that mimic the sedimentary look of a river bank. “The concrete elements of this are so unique,” says John Belarde, president of Belarde Co. Their success in pulling it off, he says, was partly thanks to their skills as a company and partly thanks to the clarity and specificity of the design concept. Tanja Wilcox, senior associate at Seattle architecture firm J.A. Brennan Associates and aesthetic designer for the project, had her work cut out for her when developing a design concept for the bridge. Although the client was the city of Redmond, a lot of the money for the project was put up by a local tech company you may have heard of — Microsoft Corp. — because their main corporate campus sits on both sides of the 520. The overall objective, says Wilcox, was to transform the overpass into an enjoyable environment for drivers, cyclists and pedestrians. But the bridge also had to celebrate Redmond as a city, while giving a nod to its patron and beneficiary, Microsoft. After much deliberation, Wilcox and her team conceived a design that evokes the Sammamish River, which wends through the heart of Redmond, just north of the bridge site. By incorporating native plants and materials as well as subtle river motifs, the design not only expresses Redmond’s beautiful natural surroundings, but also echoes the look of a portion of one of the adjacent Microsoft campuses that was also inspired by Northwest ecosystems. 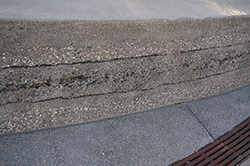 While Wilcox was doing material research, she ran across Lithocrete and its Sedimentary Wall system, billed by the manufacturer as displaying “natural formations representing the stratified characteristics of the Earth’s geological layers.” Looking at pictures of Sedimentary Wall installations, says Wilcox, “I realized that the walls could undulate … which would help to mask the bridge’s considerable slope from one end to the other.” Wilcox’s design called for the riverbank-inspired walls to offer seating areas as well as define meandering paths reminiscent of the river’s flow. The key to getting the walls right, says Belarde, was the composition of the aggregate layers, or lenses, to use the geological term. 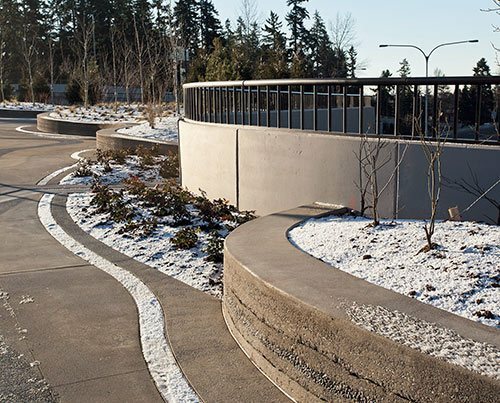 Lithocrete’s wall systemwas designed for use in sunnier climes, with aggregates from those regions, and it took some significant adjustments to make it work with the Pacific Northwest aggregates that Wilcox had specified. Belarde and his crew did sample pours for the designer and owner, but their first attempts weren’t perfect. The other two decorative concrete elements — the walkways and the roundabout — help extend the river theme across every square foot of the bridge. The walkways may not include quite the same variety of patterns and textures as the wall, but the contrast between the simple acid-washed concrete and the waves of Lithocrete with hand-seeded pebble aggregate contributes to the bridge’s atmosphere. The roundabout, which serves to usher traffic smoothly on and off one end of the bridge, was colored, stamped and sealed with Bomanite products and designed, like the rest of the project, to complement the surrounding landscape. Belarde says he was particularly pleased with Wilcox’s specifications for the roundabout. “Often, designers don’t specify a system. They say, ‘We want this stamp, this mix design, and some color.’” In these situations, the installation can end up a mishmash of different products that don’t necessarily play well together, and the resulting surface will fail within a few years. But Wilcox took the 1time to understand the products she was specifying, says Belarde, and he was able to install a beautiful roundabout that should hold up for as long as the bridge itself. Still, while the native plants helped tie the concrete elements together, Wilcox says the decorative concrete was no less critical than the flora. “With decorative concrete we were able to integrate both the flatwork and the seating walls into the design,” she says. “Both had a flowing design that would remind you of the concept of the flowing river.” Belarde’s work, she says, allowed them to express their design concept not just in the landscapes but in the hardscapes as well. 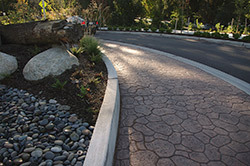 Client: City of Redmond, Wash.
General Contractor: Tri-State Construction Inc., Bellevue, Wash. Scope of project: Designed to mimic the feel of a meandering Pacific Northwest river, the 480-foot bridge spans Interstate 520 and connects two Microsoft campuses across the freeway from one another. The bridge space incorporates curvilinear walkways with bands finished with hand-seeded aggregate, a wall meant to mimic the look of a sedimentary river bank, and a stamped and colored concrete roundabout at one end.